Sometimes inspiration for cakes can come from the funniest places. 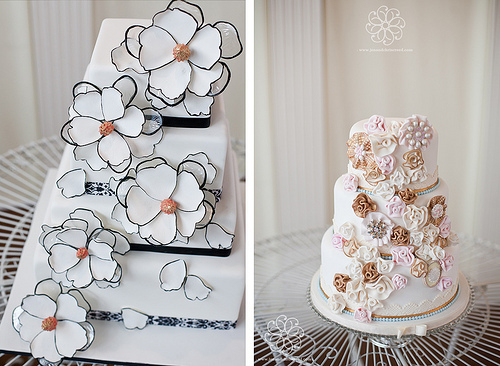 These cakes were created by Sweet Face Cakesin Nashville, Tennessee. The black and white cake was inspired by a shirt that the cake designer saw being worn by Mila Kunis. The pink and gold cake drew inspiration from her grandmother’s brooch. If you look closely you can tell that the actual brooch that served as inspiration is on the middle tier of the cake. It’s hard to pick a favorite between these two cakes. They are both similar in style but the colors of the cakes make them very different. The black and white cake is a bit more funky and contemporary while the pink and gold brooch cake is vintage and romantic. My style leans more towards the brooch cake but they are both amazing. Which would you choose? Has jewelry ever inspired your cake? Both of these cakes are beautiful! Jewelry has definitely inspired my cakes before. I actually took some of my mother’s old costume jewelry and made silicone molds for a cake at one point. I try to find inspiration everywhere; I have even made a cake based on wrapping paper before!